In the 80’s, there were many bands playing the classic Hard Rock/Classic Rock form of music and had success along Glam Metal/Hair Metal public in those days. There were those who worked mixing both ways, as TESLA used to do. But it was amazing as a band as THE QUIREBOYS came and unleashed a 70’s Hard Rock and had success back them. No, I’m not saying that they didn’t deserve it, but it was amazing how they grew fast. But as Grunge Rock came and change the musical scenario in the USA (and on the world as a consequence), many bands ceased to exist. But as the fashion went down the tube, Hard Rock and Glam Metal came back, so in 2008 the sextet released “Homewreckers & Heartbreakers” that earned them a lot of success. So, it’s not a surprise for this new release for it, called “Homewreckers & Heartbreakers - 10th Anniversary Special”. This album is a set of the best features of Classic Rock/Hard Rock you can find, with that bluesy touch. To be honest, you can simplify things and see their work as a fine blend between the energy of AC/DC with the musical elements of bands as DEEP PURPLE and AEROSMITH, and obviously done with a touch of musical accessibility. But the way they create their music is charming and personal, with a strong personality pulsing on it. And it sounds new and fresh, different from bands of this “back to old days” trend. The sound quality of the album was created to be clean and comprehensible, but with that nasty and organic feeling that their music needs. And the instrumental tunes that they had chosen are in a “plug and play” tendency, in a way that sounds like they just turned on the amps, plugged the instruments and let the music do their part. It’s a great production, indeed. The songs are amazing pieces of Classic Rock/Hard Rock, but the nasty and melodic “I Love This Dirty Torn”, the charming and introspective harmonies of “Mona Lisa Smiled” (what a great work on the keyboards and vocals) and of “Louder” (nice guitar riffs and slides); the southern bluesy feeling that comes from “Blackwater”, “Fear Within the Lie” and its accessible touch, the “put the house down” Hard Rock songs “Hall of Shame” and “Josephine” are their best shots. But the bonus tracks “Too Much of a Good Thing”, “Homewreckers & Heartbreakers”, “Mona Lisa Smiled”, “Mother Mary”, and “I Love This Dirty Town”, all of the recorded live at the 30th band’s anniversary, are fine examples that their music works in great shape in live formats. 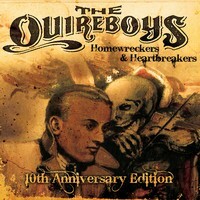 If you don’t have an original copy of “Homewreckers & Heartbreakers”, it’s your chance; if you already have one, buy this due its bonus tracks, but go and get on, because THE QUIREBOYS are not kidding.